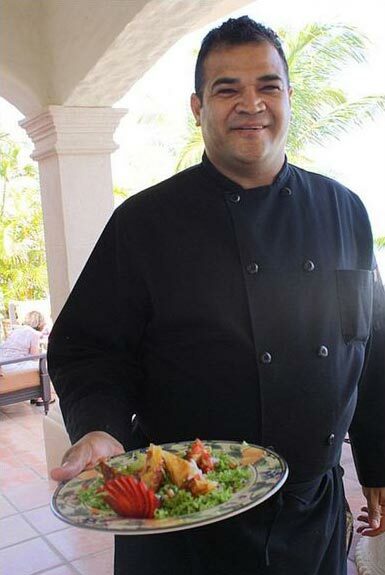 Chef Cosme is recognized as one of Cabo’s most innovative and charismatic chef’s serving the area’s many private villas. With a client list that includes stars such as Tommy Lee, Cindy Crawford, Jessica Simpson, and George Clooney. He has spent years mastering the art of vacation and loves nothing more than to make your stay unforgettable, one element at a time. Born in the border city of Mexicali, he immigrated to the US as a young adult to complete his Culinary Degree at Long Beach City College in Southern California. The following years were spent gaining experiences in resorts such as the Westin, and smaller high end restaurants in California and Las Vegas. Eventually, he made it Cabo San Lucas and fell in love with the area’s natural beauty, as well as the energy of booming tourist town. He was not only attracted by the area’s business potential, but also by the fact he could work outside the hotel world in a more intimate private villa setting. Earning him a place among Cabo’s elite culinary perfectionists and also as an integral part of all his clients vacation stays. Facilitating every detail of his guests stay and building with them the “home away from home” atmosphere which elevates a vacation from ordinary to memorable. Growing up in a border town also influenced Chef Cosmo in an unexpected way by endowing him with a natural blend of Mexican Soul and American quality that is easily recognizable and comforting to all of his guests. It’s his belief that a guest’s needs come first which is allows his client's the opportunity to choose the participation level in their own experience. Cosme's clients can be as involved as they would like - and choices range from simply picking options from a pre-set menu to fully planning the menu and pinpointing execution times, or hightening their experience with added in-villa services and area activities. There is nothing Cosme and his team cannot provide for you, as they strive to provide a real luxury vacation experience. You deserve the best while on vacation. So why not put your precious time in the hands of an expert. Contact Chef Cosme and discover all the possibilities that Cabo San Lucas and a personalized experience can offer.